This ornament reminds me of the true meaning of CHRISTmas. I feel that too many people have forgotten what Christmas is really about—our Lord and Savior. If the star is a dark color, paint it with a coat of white or off-white paint and allow it to dry completely before beginning this project. This will prevent the dark color from bleeding through. Make a pattern out of paper by placing a piece of paper over the star and shape it around one side of the star, making creases in the paper. Then lay it flat and trace over the creases to get sharp, accurate lines. Cut it out and place it over the side of the star to see if it fits. Trim if necessary. Then cut out 5 pieces from a book page or sheet music, turn over the pattern, and cut 5 additional pieces from the book page or sheet music. Spread some Mod Podge over one of the sections of the start with your brush and smooth the piece of book page or sheet music over it, smoothing out any air bubbles. Don’t worry if it doesn’t fit perfectly. Just make sure you cover all of the metal and you can trim the excess later. Complete one section at a time (so that the Mod Podge doesn’t dry out) until you have completed the star. Allow the Mod Podge to dry. Then turn the star over and trim any excess paper along the edges. 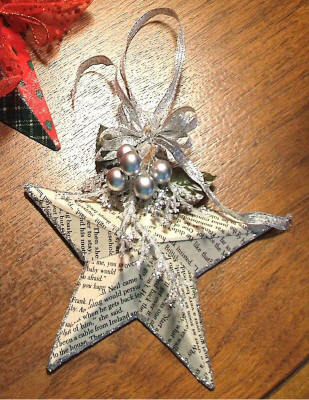 Then apply a coat of Mod Podge over the front of the star, making sure to smooth down any paper that has lifted or puckered. The Mod Podge will be white and cloudy but dries clear. Embellish the star with Christmas greenery, berries, etc. Add a ribbon hanger and bow.